Visit our beautiful studio and practice in comfort and safety. We keep the practice room heated to between 95 and 100 degrees (about your body temperature) so that your joints and muscles are properly warm to practice safely and effectively. Fresh air moves through our big spacious studio so that you can breathe easily. 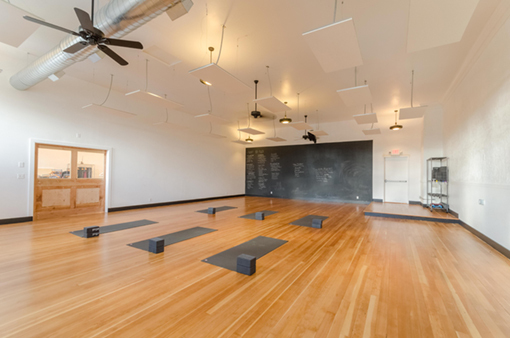 We heat the studio with far-infrared radiant heat so that the air doesn’t dry your sinuses or your skin. Our Mission at yogaRIOT is to cause a ruckus in your being, to disrupt the status quo of your yoga and to create space for you to step into your biggest most powerful self. With over 40 classes a week, you can practice no matter how busy your schedule. Monthly workshops to expand your practice and take you to the next level. Find the HEART of your personal practice by finding your Teaching Voice.